GUESS I WILL GO START A NOVEMBER THREAD! CHAR CAPS IN USE: VISUALLY IMPAIRED!!!!! GOOD MORNING EVERYONE. CLEANING DAY HERE! AND HUBBY IS GOING TO WORK ON PUTTING THE BEDROOM FLOOR IN.ENJOY YOUR DAY. Not having internet is hard, Frannie!! I know what you mean about using public interent. I have had to use the internet at the library twice this year, and I felt very uncomfortable about it. I didn't go on any of my sensitive sites. I would go to the bank to do my banking on their computers, or go to my son's house and use his. I am very excited for my next trip to visit my daughter since I got the Amazon Fire. I can take it with me for most of my internet needs and just use their computer for a coup[le of things, instead of dragging a laptop with me. I am waiting not too patiently to get some photos of my grandson in his costume. My daughter wouldn't tell me what he is this year, but apparently he picked it out. "What you do speaks so loudly that I cannot hear what you say....Ralph Waldo Emerson"
Good morning all, it is Halloween and the treats are stacking up here. Working in a grade school makes not eating sweets so difficult. They are all over today! Every classroom will have a party and our parents just go overboard for sure. then of course the teachers bring treats to share in the teachers lounge. I can't even go in there this time of year. It is a little crazy. You really have to be single minded about it, I get off now and again but mostly try to stick with a no sweets at school rule. It is just so hard when it is all around you. Don't mean to grouse, I just have to stay in my office today and then most of it will be gone. With Christmas coming I have to really strengthen my resolve so I stay out of the teacher's lounge as much as I can and bring healthier snacks for me to munch on. I was doing really well until this week. It is chilly here but a really nice day, we will have a Halloween costume parade this afternoon and they will get to parade around the block. When the weather is bad we only parade in the gym. I will be out of town starting next week for a little over a week. I will have very limited access to the internet (my BIL is not tech literate and does not even have a computer at home!) I will be taking my tablet but don't think I will have much internet access. I don't like to use public internet at all if I can avoid it. Co - Leader - Invincible Indigos! THREE TEAMS AND ALL THE SAME NO ONE TO TALK TO PRETTY SAD WHAT ARE THE CHANCES OF THREE TEAMS!!!!! then off to work I go. Enjoy your day everyone. GOOD MORNING! HERE WE ARE HUMP DAY AND TWO MORE AFTER TODAY TO GO! CHANGE THE CLOCKS THIS WEEKEND EVERYONE! HAVE A GOOD ONE! Good morning everyone, hope you are having a good day where you are. It is cloudy here but not too bad for a fall day at the end of October. We are having our 1st assembly in our new gym. 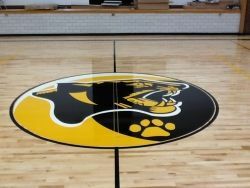 Last year they added on 4 classrooms and a cafeteria (we were using the gym for lunch before) and when they started adding the cafeteria they found out the gym floor was sinking. No one knew why but they had to find out. Then they found out the old ventilation system was terrible and the gym floor was too dried out to fix so it all had to come out. (old school buildings are like old houses, you never know what you will find). Now we have a brand new gym floor, new ventilation, new lights, the walls are painted, it looks so good! Have a great day everyone, I am going to go join the assembly and enjoy our new gym! Good morning. Well I am another year older today bummer getting scary now. Madde, remember that slow but steady wins the race. And for most people (myself for sure), ANYTHING at all is better than what I was doing--i.e., nothing!! I'm lucky that I have a cat--he doesn't wake me up early since all he has to do is go to his litter box! He used to wake up and yell at me to feed him, but he is so old now that he sleeps until I get out of bed and wake him up. GOOD MORNING! HOPE ALL IS GOING WELL WITH EVERYONE. IT IS A RAINY DAY HERE TODAY! GOT MY CLEANING DONE YESTERDAY AND MADE HUBBY MEATBALLS AND FROZE THEM WE HAD SOME LAST NIGHT FOR DINNER. TODAY I NEED TO IRON A LITTLE AND MAY DO A SMALL LOAD OF WASH AND HANG THEM ON A RACK TO DRY SINCE IT IS RAINING. HUBBY DID BODY WORK AND PAINED SIL CAR SO THEY WILL PICK IT UP TONIGHT AT ABOUT 830 HE HAS OTHER PLANS SO THAT IS WHY LATER. Pet kids are always up early so ... Even on Sunday it is 6 am for me? I have exercised and am looking at Spark for some additional things I can do to bump up my routine. Starting very slow so I don't get discouraged. "Each today, well-lived, makes yesterday a dream of happiness and each tomorrow a vision of hope. Look, therefore, to this one day, for it and it alone is life." A pretty mellow day. One possitive is that I got my husband signed into SparkPeople and taught him some basics about entering in food log...woohoo! One thing that is frustrating is when he goes to enter a food that I know I have entered in the past we can`t seem to find my entry when we check the box "Search food shared by other members". Considering we eat the same foods it sure would be convenient if we could just access my entries! So far so good--I did the treadmill this morning at a pretty slow walk. I did add a little incline but not too much. I shall wait to see how I feel tomorrow!! I had a sandwich for dinner last night. It was my weekly trivia game and there is not as much choice as would be nice. Other than that, I have been good about staying away from all wheat for over a week. GOOD MORNING! BEEN DOING GREAT AS USUAL WITH EXERCISE IT IS A GOOD HABIT NOW1 BUT NEED MY MIND SET TO EAT RIGHT!!! HAVE A GOOD ONE WORK IS CALLING ME! Hi all, hope you are all having a good day. We had a "Sand-witch" lunch at work today. I started out really well ate some turkey with cheese, no bread, no mayo. Had some hummus with veggies and only a few chips. But dessert took over, I had a cupcake and a cookie! So only a light dinner tonight! Barbara, do take care of yourself. I do understand why you miss it but don't over do. I haven't been to the gym in a week because of my leg, and I really do feel it. I am going tomorrow but I will be very gentle! Sorry I have been MIA, I spend so much time on a computer everyday at work it is sometimes hard to look at one when I get home. So I am posting at work, just taking a quick break to say Hi! I also wanted to share this really good article on Strength training I read. Just one more reason to get to those ST exercises! I'm still struggling with an injured IT band, so just waiting to see if it will be wise to go to the gym on Friday and do some light work. Hi everyone! I am back. Trying to build a website today. Not going well so I took a break. Have a great day! GOOD MORNING EVERYONE. LET'S HOPE TODAY! HUBBY BROKE DOWN GOING TO . WORK WAITED 4 HOURS FOR THE TOW TRUCK HAD TO CALL OFF WORK. I HAD A VERY ,VERY BAD DAY AT WORK HAD WORDS WITH A NO IT ALL AND TOLD HER OFF.SHE WAS LYING THROUGH HER TEETH. CORPORATE OFFICE IS GOING TO BE THERE TODAY!!!!! WELL WHEN NO ONE IS HERE NO ONE TO TALK TO! Hi team! Thanks for the note! Sorry I'm not around much . . . . I'm cutting back on my time on-line, sitting at the computer.... need to keep moving it. Bought a treadmill and some weights. . . . . I'll try to do better. Seriously, no one else out there? I know that I fall off the thread occasionally, and I have feeling others have as well. GOOD MORNING! ONLY GOT THE OLD FLOORING TAKEN UP AND CLOSET DOORS REMOVED. TODAY AND TOMORROW HE WILL WORK ON MORE HE IS OFF MONDAY SO MAYBE BY THEN IT WILL BE DONE. WE HAD A HOUSE FIRE SMOKE DAMAGE ONLY AND REMODEL HAD ALL BUT THIS ROOM AND THE COMPUTER ROOM REPLACED. TODAY IS HIS ND BIRTHDAY NO PLANS. GOOD MORNING! HUBBY IS PUTTING DOWN HARDWOOD FLOOR THAT WE HAD FOREVER FINALLY IN THE BEDROOM THAT WILL FREE UP MY DINING ROOM WHERE IT WAS STORED! IF HE DOESN'T GET IT DONE TONIGHT I HAVE TO DIG OUT A PACKED AIR MATTRESS FOR TONIGHT! WELL ENJOY YOUR DAY EVERYONE OFF TO DO MY EXERCISES TAKE CARE. I am so spoiled by the lack of humidity in SoCal that this little bit we are experiencing is killing me! It's cooled down to a cozy 80 something and would be lovely with it. GOOD MORNING! WELL LOOKS LIKE I HAVE TO CALL THE DR. TODAY FOR A SHOT IN MY HAND TRIGGER FINGER OUCH AND ITS' THE HAND I WRITE WITH GRRR. HAD THE OTHER HAND DONE LAST YEAR AFTER SHOTS HAD IT OPERATED ON SO THAT IS WHAT WILL HAPPEN WITH THIS ONE AS WELL SO PAINFUL THIS ONE MORE THAN THE OTHER ONE. BARBARA THAT'S GOOD. HERE AT WORK THUGHT I CHECK IN BEFORE AAND DIDN'T. TAKE CARE HAVE A GOOD ONE EVERYOE. I did go to the gym on Tuesday although I was not aggressive. I think that the exercise actually helped my leg, or maybe it is the naproxen I have been taking! Either way, it is feeling better than it did Sunday, so I am keeping my fingers crossed! GOOD MORNING EVERYONE! VERY COLD THIS MORNING BUT THEN AGAIN IT IS OCTOBER! OFF TO WORK IN A FEW ENJOY YOUR DAY EVERYONE. BARB I MAKE SUNDAY MY FREE DAYS. I'm feeling guilty today--I just could not get out of bed this morning so I passed on the gym. This is becoming too easy to do on Sundays! Garage sale today wish me lots of money. TGIF!!!!!!!!!! FINALLY! EXERCISING AND WILL SHOWER AND HEAD TO WORK SOON THEN HOME TO CLEAN! TOMORROW ANOTHER GARAGE SALE AND NICER WEATHER THAN LAST WEEK! HAVE A GOOD DAY SEE U ALL LATER! GOOD MORNING! GOT MORE PACKING DONE LAST NIGHT AND MORE TO COME TONIGHT! HOPE TO HAVE THE BEDROOM FINISH CLOSETS ARE DONE NOW ONTO THE DRAWERS. HAVE TO LEAVE CLOTHES FOR LAST OF COARSE. THIS COULD TAKE A YEAR WHO KNOWS! Good morning everyone. Riding my bike as I post. The weekend was a success. I will donate what is left after I do this again next weekend. Back to work bummer. Enjoy your day everyone. It rained during the night, which was unexpected, and it has cooled down so beautifully that it is almost as if the two months or so of killer heat we had didn't exist!!! I will enjoy it as long as I can. My daughter was born on Halloween, so she considers it "hers"! GOOD MORNING! GETTING LOTS DONE HERE FOR YARD SALE AND PACKING HOUSE UP WITH WHAT I CAN AS I GO GETTING REALLY TIRED! MY KNEE IS SO SORE NEED TO GET IT FIXED BUT INSURANCE MAKE YOU GO THROUGH ALL THESE DIFFERENT TYPES OF SHOTS SO EXPENSIVE WITH COPAY AND DEDUCTIBLES. Halloween is my favorite kids' holiday.. My ex had our kids for Christmas and Easter. I always dressed up when we went out for trick or treat and still do that with the grandkids. Total Points You Earning Today?